Thrilled with my first foray into Chinese clay pot cooking, I went back into the kitchen a few hours later ostensibly to cook some “merienda”for the crew… The commissary was a abuzz with pre-Ironman preparations, so there were lots of ingredients and dishes being prepped. 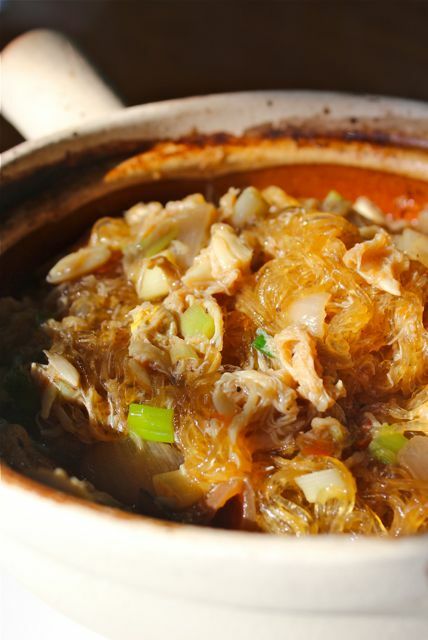 I swiped a whole slow-roasted onion and a slow-roasted head of garlic, a cup or so of steamed and peeled crab meat, more sotanghon or mung bean vermicelli noodles, and some green onions. 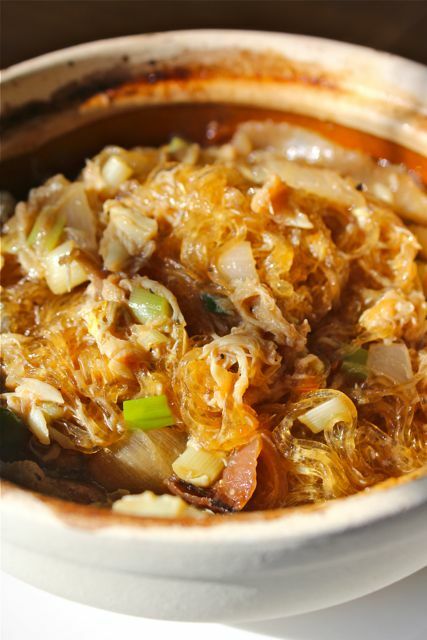 Place your clay pot over medium high heat and add some vegetable oil, or a touch of chicharon oil or lard. Roughly chop up your slow-roasted onions and garlic (squeezed out of their skins) and add this to the clay pot. Add the crab meat (1 cup was a bit too abundant, you can lessen this a bit) and saute for a minute or two, add some hoisin sauce, a touch of kikkoman soy sauce and a cup or more of crab stock if you have it (chicken broth or water would work as well). Throw in some chopped green onions and some black pepper and stir. Wait for this to come to a boil around the edges of the clay pot. “all naked and scrumptious” need not apply to crabmeat only, no? kidding aside, this is how i like my sotanghon crab..all crab and no shells. wish merienda were like this everyday! I have to agree with Clarissa. Sotanghon is mung bean noodles, not rice. Interesting! I always thought Sotanghon was a rice noodle! You cut the sotanghon after you’ve put it in the pot? Isn’t that a little bit messy? I normally would soak the noodles briefly in water and cut them to desired length before I add it to the broth. That’s easier to manage. we were at the escario branch last July, i didn’t see any sotanghon on the menu. though that day was raining, zubuchon was still bustling with customers. my hubby knows one of your servers – though they call each other on first-name basis (we are practically neighbors), he addressed my hubby as “Sir.” my hubs found it very amusing. one thing i didn’t like though, i had to cross to the other side to use the toilet and like i said it was raining that day. besides that, everything else was a wonderful lunch experience. will try again other dishes come Dec-January when we have to be home again for Christmas and Sinulog! hi terrey, we do have a sotanghon pancit on the menu, but not this particular dish in the post above. I am sure the server was just being polite, or properly trained. :) As for the bathroom, I agree with your sentiments, but the space wasn’t really outfitted with sewage outlets, hence the need to go to common bathrooms across the way. Next time, if you let a server know, we do have umbrellas for guests to use to make the brief walk less damp if raining. But thanks for visiting us, and we look forward to seeing you again around Sinulog!